Here's a tune I've managed to overlook during the years I've been putting tunes on this site. It refers to the Blarney Stone the kissing of which is reputed to leave a great facility for fine talk on the lips which were in contact with said stone. 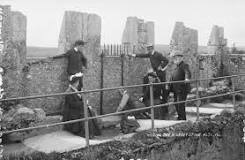 I was taken for my contact with the Blarney Stone when I was a child, though I think I was held the wrong way up and the incorrect bit of me made contact with the little rock of eloquence.